The creative life of a marbler is similar to that of a writer--work is usually done in solitude. It's just the marbler, her tank, and her paints surrounded by lots of wet paper. We like it that way. That being said, I have never met a group of artists so vocal about process. 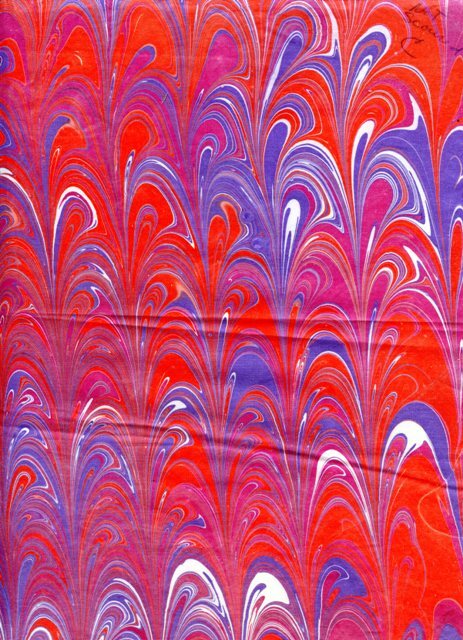 Ask a room full of marblers (or a message board full of marblers) one seemingly simple question about marbling and you will have a day's worth of insightful discussion. Easily. (Ask about red paint and it will be a week-long conversation.) There are, of course, those who keep their mouths clamped tight, but for the most part, I am always impressed with how generous marblers are in the sharing of their knowledge (especially considering the historically secretive nature of the art form). I would give anything to have another marbler living near me. There are not a lot of us out there to begin with and those that are are spread all over the world. There are many miles between us. 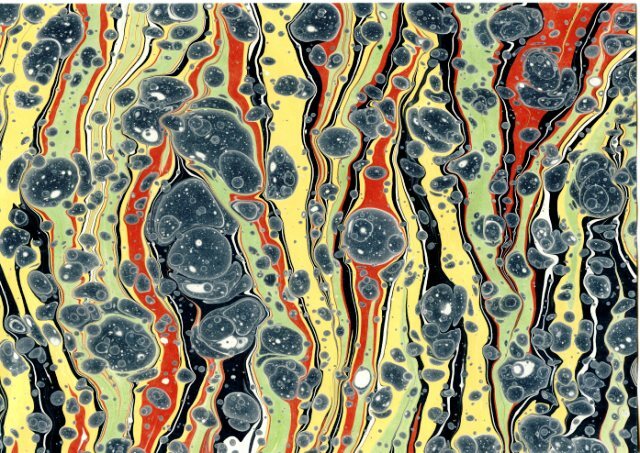 On top of that, marbling is not an art form that is granted permanent displays at museums (and very rarely is it given a temporary one even). 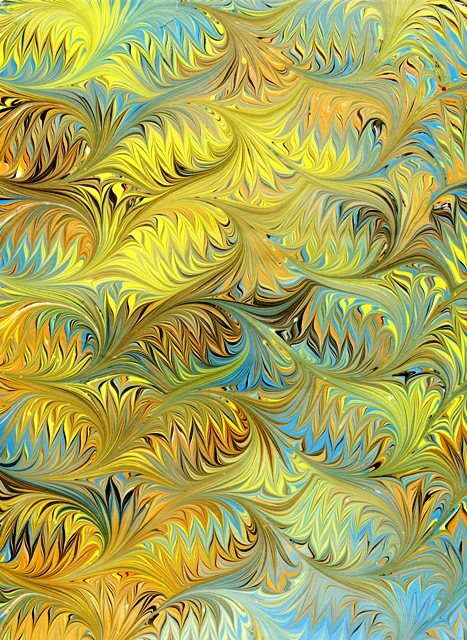 My opportunity to see other works of marbled art is limited to websites or books. 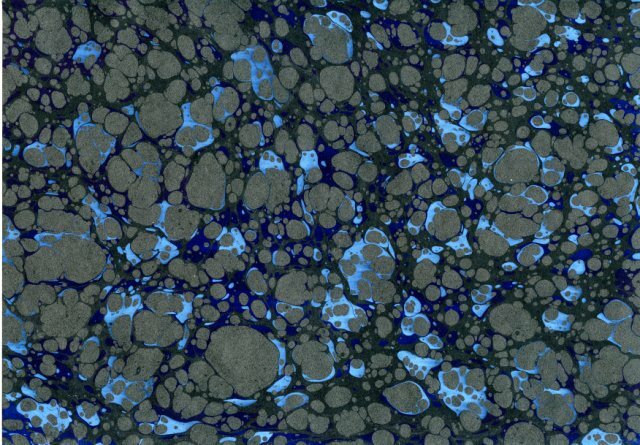 And while that satisfies me briefly, there is nothing like seeing and holding a marbled piece in person. NOTHING. 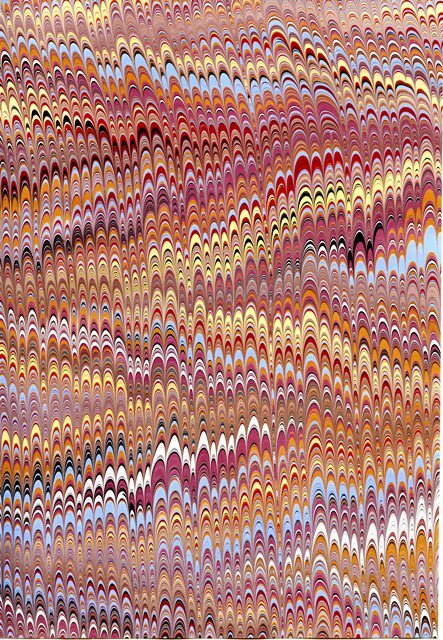 I cannot tell you how many people who see a marbled piece I've posted online and then see it real-time comment, "Oh, my! That's not what I expected at all!" 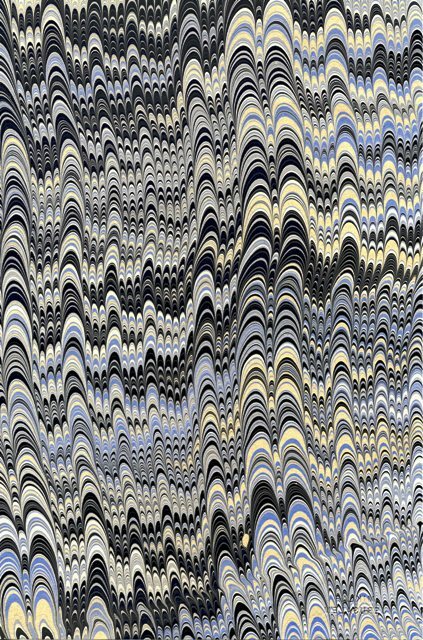 Marbling is one of those art forms that truly needs to be experienced firsthand to be fully appreciated. Late December, I was feeling particularly isolated in my work and was overcome with a desire to be with other marblers--but short of hiring my own private plane and jet setting around the world, I knew it wasn't going to happen. That's when the idea of a paper swap popped into my head. 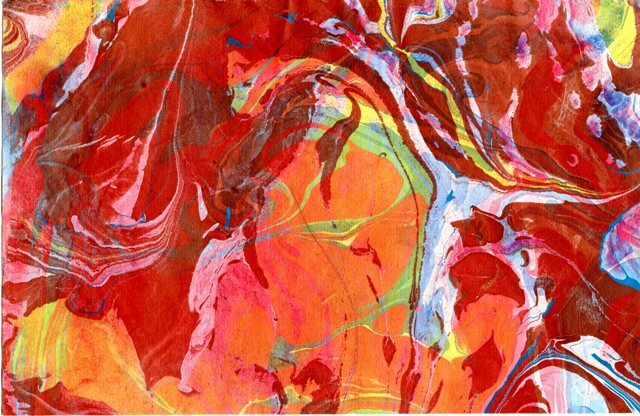 For those who don't know what that is, a swap is where you are given the mailing addresses of a list of people who want to participate in the swap and you send one marbled piece to each of them. In return, each person on the list sends you one piece. I posted the paper swap idea on the marbling board and immediately got 10 enthusiastic and delightful artist from all over the world--Israel, Australia, the UK, Canada, each coast of the US and in between-- wanting to participate! I was so excited. And then the papers started to roll in. Exhilarating. Beyond my wildest dreams. Electrifying. Intoxicating. When I held in my hand the first piece that arrived in the mail, I was nearly moved to tears. And then the next one came in and it took my breath away. And then the next one and the one after that and up until the very last piece...envelope after envelope delivered one beautiful piece of art after another until all I could do was shake my head in wonder and awe. As each piece arrived, I studied it like any true enthusiast, holding it close to absorb the details and then afar for perspective, exploring the surface, turning it over to see the original paper, again and again until I knew each piece so intimately, I felt obligated to buy it a drink. 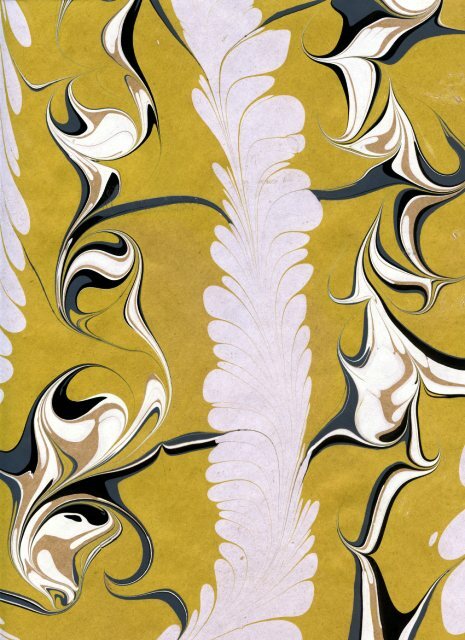 The papers also came with a brief history of the artist--how and when he or she got into marbling, the type of bath and paints used, favorite paper to work on. After reading these stories and picking up the papers again, they began to take on a life of their own, vibrating with their creators' energies. It. Was. Spectacular. All the papers posted here are from that swap. Not one is my own work. They are, however, proudly displayed in my studio, a mini-exhibit of sorts, granted permanent status in my very own museum dedicated to the art of marbling. I'm so sorry most of you can't experience these firsthand...but I am grateful to have at my fingertips such treasures to reach for the next time I need a marbling fix. Many, many thanks to the artists who participated, for making the time to do it, for being curious about the work of others, and for bridging the gap between us. 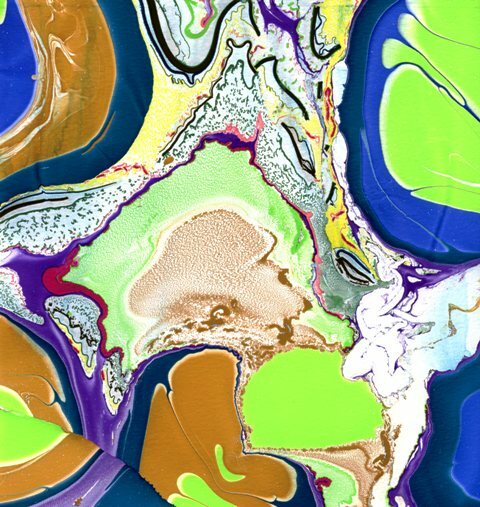 You are a source of inspiration and fuel my passion for marbling.